Independent Contractor or Employee? The choice is not yours. 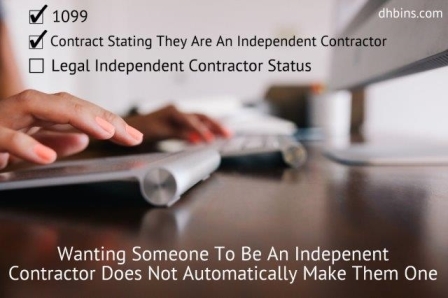 It takes more than calling someone an independent contractor to make them one. Many people think they get to pick if someone is an employee or independent contractor. This is not the case. This is the list of criteria used to define who is an employee vs. an independent contractor. Getting this wrong can be a costly mistake. An employee is instructed about when, where and how to do work. This refers to the notion that the more detailed the instruction is that's given, the more control the business has on the on the individual performing the work. The key consideration is whether the business has retained the right to control the details of a worker's performance or instead has given up that right. Training provided by the business indicated how they want the work done is strong evidence of an employee relationship. Independent contractors often make sizable investments into the equipment used for the performance of the job. It's likely that independent contractors are not reimbursed for their expenses. Another key characteristic in an independent contractor is the ability to suffer a financial loss during the job. Independent contractors enjoy the freedom to seek opportunities within their market. They are allowed to advertise themselves, keep a business location, and to work wherever desired in the their market. Independent contractors also are generally paid on a by-job basis, while employees are paid on salary or wage for their time.